Caelum is an uninhabitable gas giant like Jupiter. High above it are the Risen Kingdoms, occupying flying continents called cratons. Remnants of a shattered world, these vast disks of soaring stone may be a thousand miles across. Suspended by magic, they float in the upper layers of Caelum's clouds. 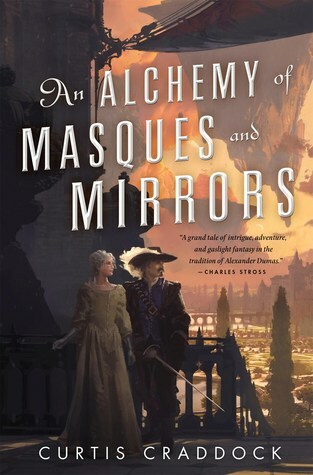 An Alchemy of Masques and Mirrors has a lot going for it: a well-presented quasi-historical setting, steampunk elements, a dashing hero, a courageous heroine. The plot and characters caught and held my attention throughout, and the pacing was generally well handled, keeping me turning the pages late into the night. The book throws the reader straight into the world of the story; however, careful world building takes place as events progress, gradually painting a full and colourful picture. The only major thing that stood out as a negative for me was the ending, as I found the proposed future romance forced and confusing in light of the future against which the characters had been fighting throughout the entire story. Despite that, this was still a most enjoyable read sure to please fans of steampunk-inspired fantasy.